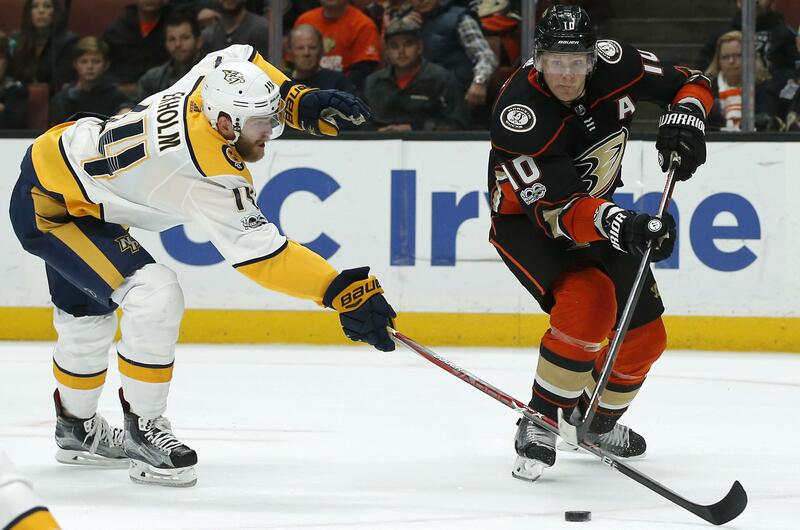 Fri., Nov. 3, 2017, 11:35 p.m.
Roman Josi scored one goal and assisted on another as the Nashville Predators built a three-goal lead before holding off the Anaheim Ducks 5-3 Friday night in Anaheim, California, in a rematch of last season’s Western Conference finals. Scott Hartnell, Matt Irwin and Viktor Arvidsson also scored for the Predators in the first meeting between the teams since Nashville won their 2016-17 playoff series in six games to reach the Stanley Cup Final. Pekka Rinne made 35 saves and P.K. Subban added an empty-net goal with 18 seconds left. The Predators had lost four straight in Anaheim since their previous victory on April 4, 2014. Antoine Vermette, Hampus Lindholm and Jakob Silfverberg scored for the Ducks, who cut it to 4-3 in the third period after trailing by three late in the second. Oilers 6, Devils 3: In Edmonton, Alberta, Connor McDavid had three assists and Edmonton handed New Jersey its first road loss of the season. Drake Caggiula, Ryan Strome, Oscar Klefbom, Milan Lucic, Leon Draisaitl and Ryan Nugent-Hopkins scored for the Oilers. They snapped a two-game skid to improve to 4-7-1. Taylor Hall, Jesper Bratt and Brian Gibbons had goals for the Devils, who dropped to 9-3-0 overall. Published: Nov. 3, 2017, 11:35 p.m.